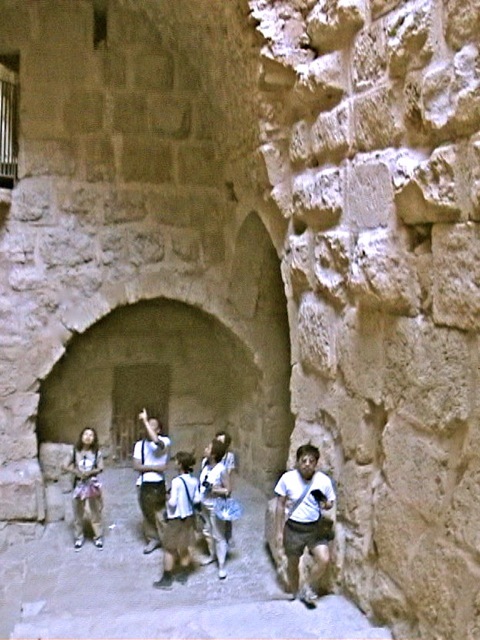 We visited Jordan a few years ago and we still remember it fondly. It was one of our best tours. 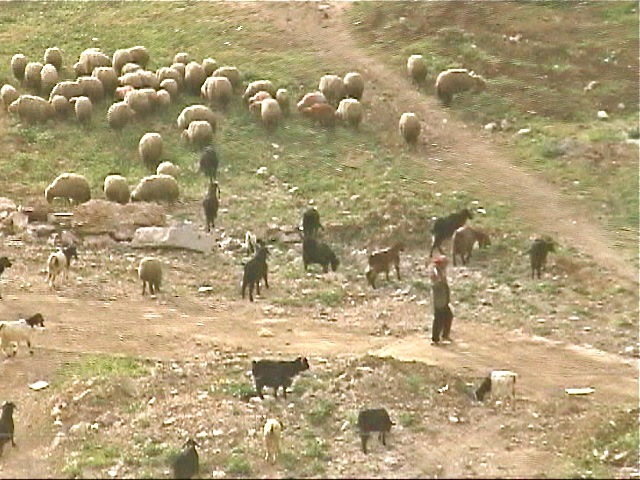 In its capital city Amman, we saw shepherds grazing their flocks on a vacant lot near our hotel. We also saw prisoners being put to good use. 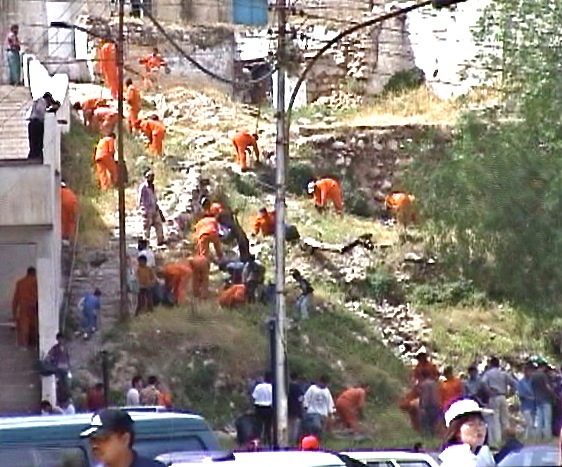 For their offenses, they repay society by cleaning up the city. Citizens gathered to “sidewalk supervise” and to see justice at work. 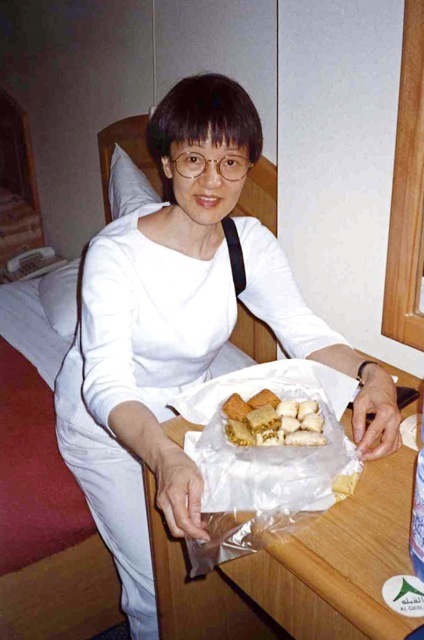 We remember places we visited by the food we eat. 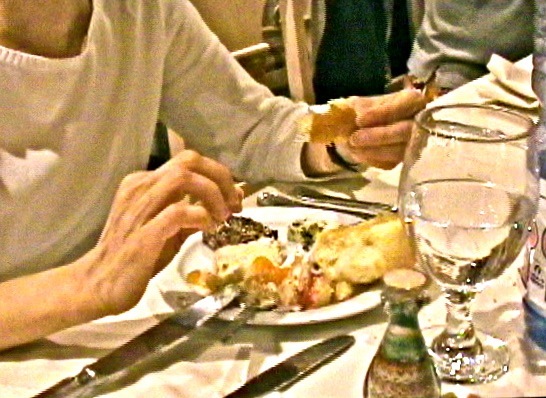 In Jordan, we found surprisingly good food. We bought sweets from a neighborhood grocery store and discovered the most delicious halava made from sesame seeds. When Sally took the first spoonful from the plastic tub, she rolled her eyes and gave a cry. She thought she was in heaven. We also had the most tender and delicious lamb dishes and, surprisingly, blue cheese. We ate the Jordanian national dish mansaf for days, and really liked the lamb stew in yogurt. We have been looking for this dish for years and still have not found it served anywhere else. We may have to return to Jordan to eat mansaf again. Some of the native Bedouin still prefer to live their nomadic lives in the desert. 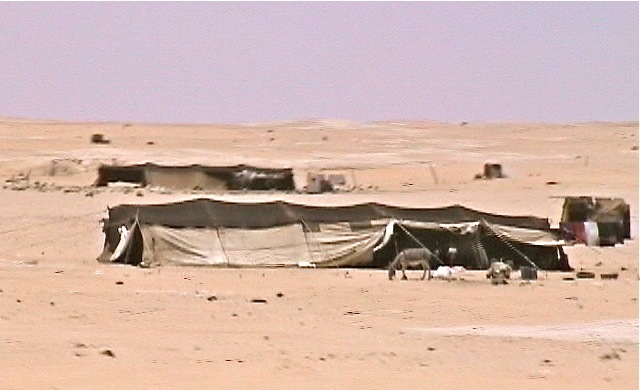 They make camp on barren desert and travel by motorcycles instead of camels. 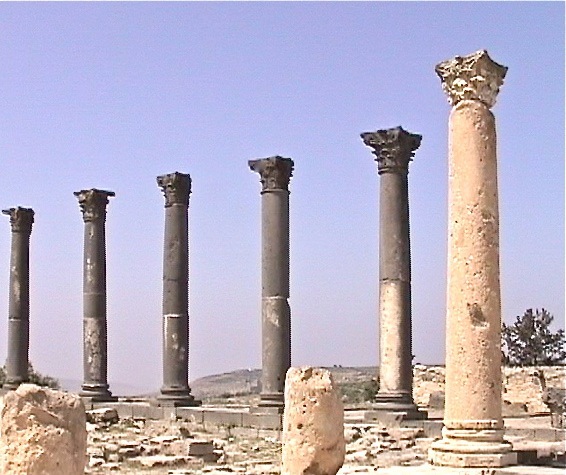 Romans occupied Jordan for centuries. As Romans did in all its conquered lands, they built towns with Roman architecture and monuments. These columns are some of relics. A big amphitheater was built for entertainment. 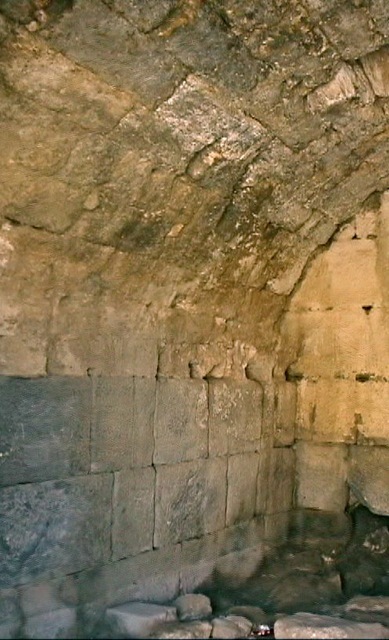 The stonework was skillfully done and created this gently curved tunnel under the seats. 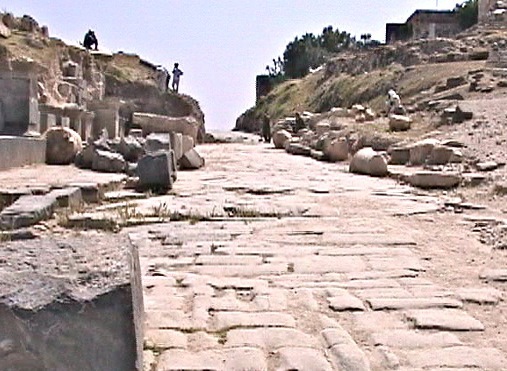 This Roman road with the original paving stones bear tread marks from chariot wheels. 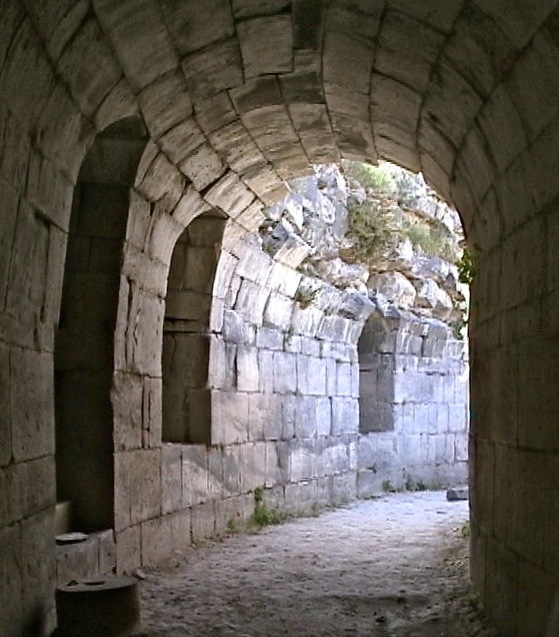 An arched room by the main street was a store in this Roman town. Roman stonemasons created timeless works of art. 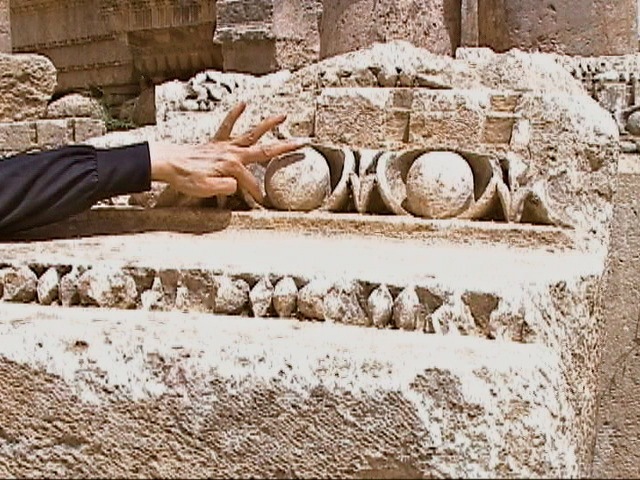 This piece of stone from a building featured deeply carved crevices to accentuate the balls. This design is still being used. 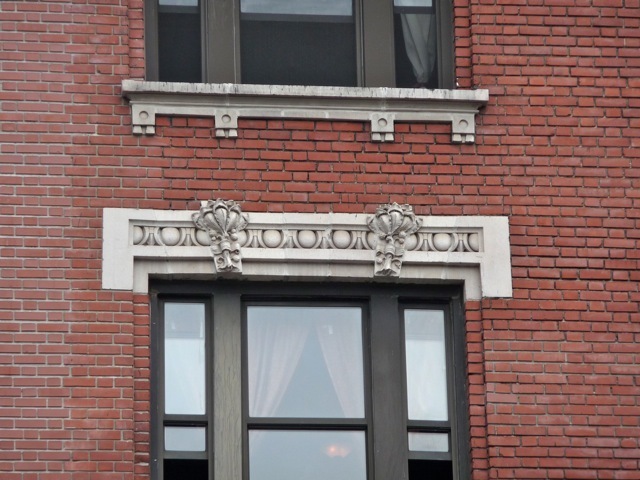 A window in New York copied the stone work of ancient Romans. The Roman stonemason should be proud. The crusades conquered Jordan for a brief period and kept their holdings with strong fortresses. This is part of a Crusaders fortress. 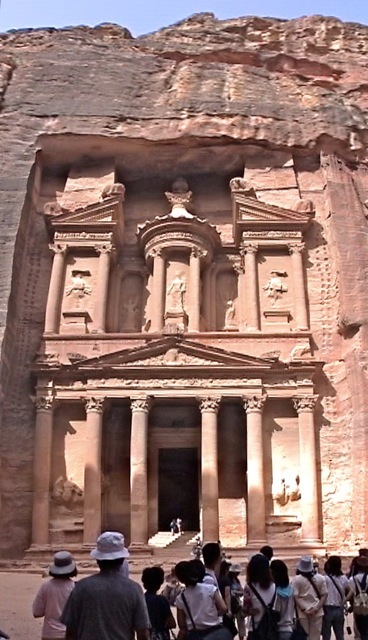 We visited Petra where an ancient people built a center of trade 2,500 years ago. 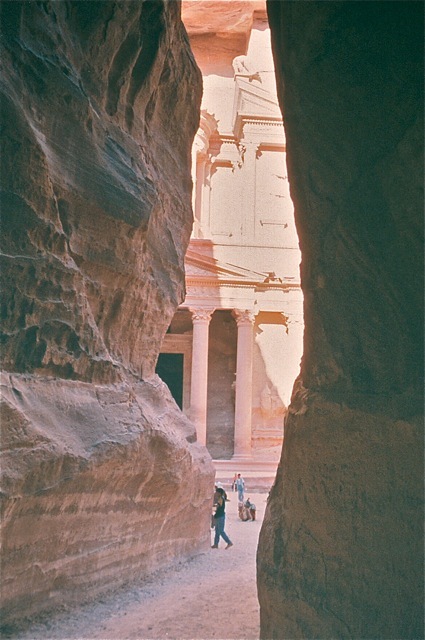 The approach to Petra is a high and narrow canyon which led rare rainwater into the town. 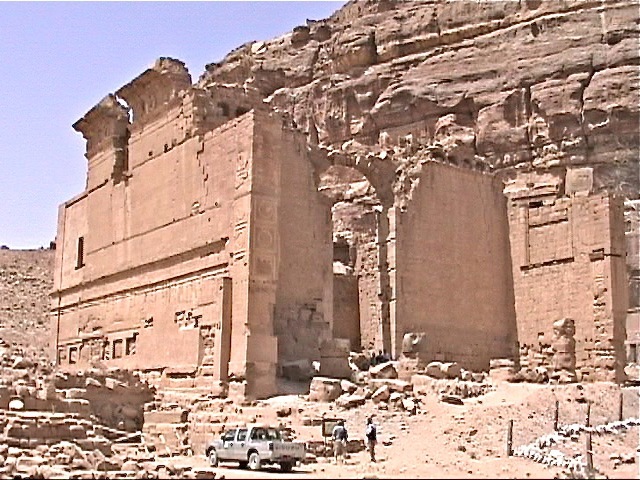 At the end of a 15 minute walk, the tourist is surprised by the sudden appearance of a beautifully carved temple in between steep walls of the canyon. This is the classic scene of the movie “Indiana Jones”, and is commonly named the Treasury. The structure is a facade meticulously carved from a stone cliff. Its details are still visible though Bedouin shot and destroyed statues fearing they were devils. The moment Sally saw the Treasury, she was as dumbfounded as the other tourists. Inside the Treasury, we found a large square room with no exit. We did not find the tunnels Indiana Jones took to enter caves with gold and jewelry. Petra is full of carved facades and smaller caves. 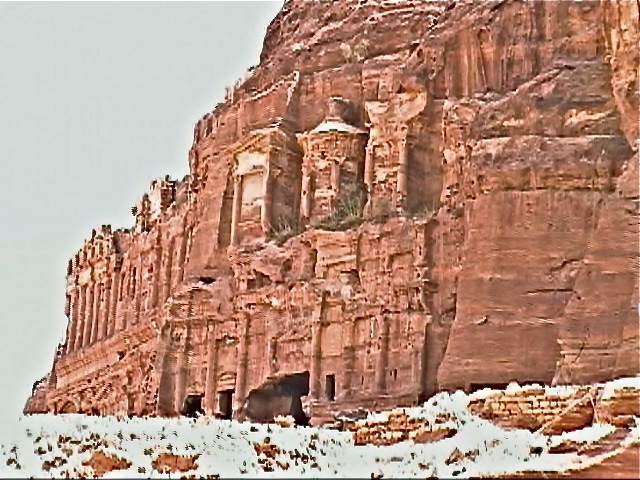 As a chock point of an ancient trade route, Petra taxed merchants and had plenty of money to build elaborate monuments. Some of the facades are not as well preserved as the Treasury, but some are as grand as the Treasury. 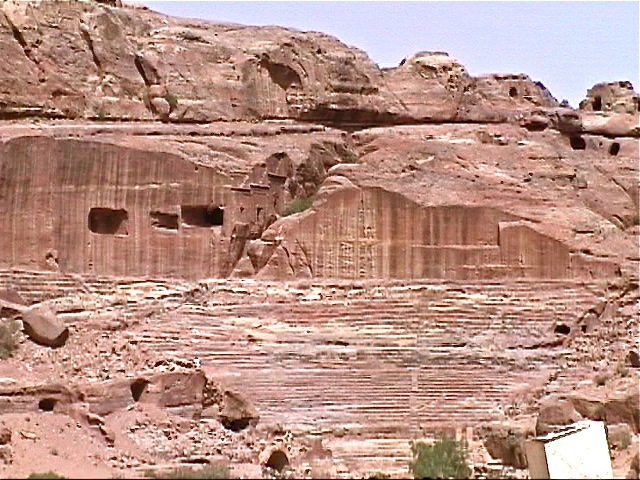 These buildings are thought to be burial chambers for rich Petra residents. There is also an amphitheater in Petra for entertainment. Earthquake collapsed some buildings. This grand building’s arched doorway is barely holding up. 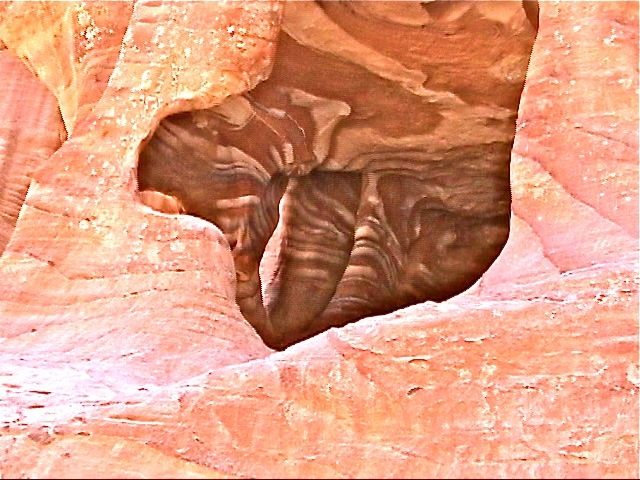 Rock formation in Petra creates fascinating wavelike patterns. 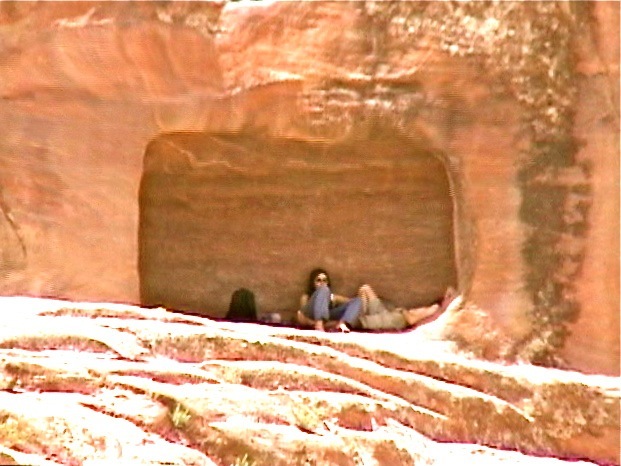 Two tourists tired of exploring Petra in the ferocious heat sought shelter in a cave. The way into Petra is downhill while the way out is uphill. Walking uphill in the heat and exhausted from touring is difficult, and a horse ride is a life saver. 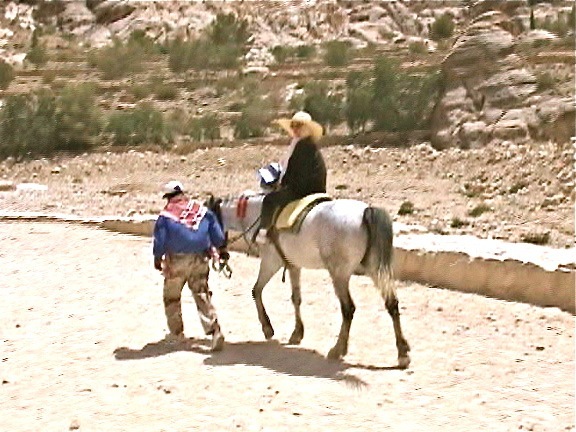 If you visit Petra, don’t ride a horse into Petra. Save the money for the exit trip. 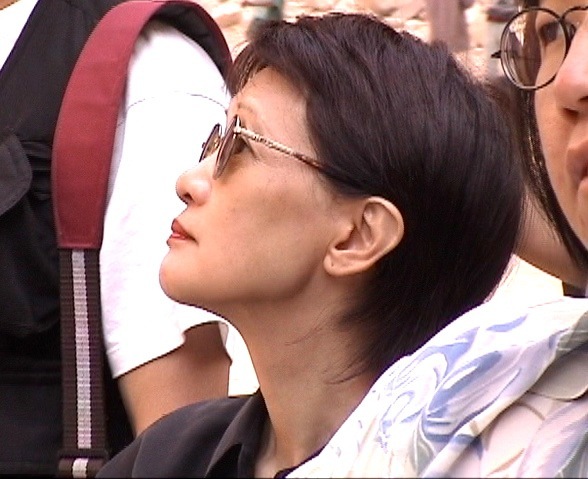 Posted by Robert Wu on Tuesday, June 1, 2010, at 8:42 am. Filed under Uncategorized. Follow any responses to this post with its comments RSS feed. You can post a comment or trackback from your blog.